The rain is pouring down outside the Hi-Lo Lounge in Athens, GA, but the night’s dreary weather only gives the crowd inside an excuse for another round. Perched on stools at the bar’s edge, my husband and I watch as grad students clustered on sofas argue about politics and craft beers, and assistant professors mingle with artists along the wall, while two overall-clad farmers chat in a corner over a table laden with burgers and fries. Ordinarily, I’m not one to strike up conversations with strangers, but tonight I can’t resist. This is Athens, GA, after all, and if I’ve learned anything from the times I’ve spent here over the years, it’s that this town is one of the easiest places on earth to make friends. Besides, the guy next to me is holding onto his faded green hardback like it contains the master plans for the Death Star. I need answers. He smiles shyly. “Autumn of the Patriarch, by Gabriel Garcia-Marquez,” he says, showing me the cover, which is emblazoned with the words El otono del Patriarca. “It’s in the original language, because I’m from Colombia,” he explains. Wouldn’t you know it, Gabriel Garcia-Marquez just happens to be one of my favorite authors. Plus, the story of how this Colombian ended up in the land of peaches and boiled peanuts simply begs to be told. An hour later, more drinks have been poured, the guy and my husband have exchanged business cards, and I’m now following our new friend’s chihuahua on Instagram. Located an hour and a half east of Atlanta, Athens is best known as home to the venerable University of Georgia (full disclosure: I am a UGA alum — I may be slightly biased) and the birthplace of legendary rock groups REM and The B-52s. Fortunately, there’s far more going on here than tailgate parties and aging rocker reunions. Athens’ thriving arts and music scene and increasingly sophisticated selection of restaurants is matched by a friendly small-town vibe, making it ideal for a weekend getaway. I’ve traveled the world since graduating from UGA, and Athens remains one of my favorite cities on earth. Follow along on our weekend adventure and you’ll understand why. On this trip, we opted to stay at Graduate Athens (295 E. Dougherty St.), a boutique hotel close to downtown and the UGA campus. We check in at the Foundry, a more than 150-year-old brick structure that once housed the ironworks where both the university’s famous arch and double-barreled cannon were made. Today, the Foundry holds Graduate Athens’ beautifully decorated lobby and coffee shop, plus a restaurant and music venue. My husband and I enter through the hotel’s front doors laughing and stop short as 20 sets of eyes dart up at us from behind laptops cluttering every tabletop in the lobby — it’s exam week and students have turned the hotel’s coffee shop into an impromptu study hall. “Well, I guess it’s very … authentic,” I whisper to my husband as we tiptoe across the room to the counter. Although clearly unplanned by the staff, these students provide a fitting final touch to a hotel devoted to recreating the UGA experience for alums. Room keys here resemble 1960s-era student IDs, and the decor is tastefully retro, right down to the old-fashioned telephones beside each bed. This is our room at Graduate Athens. Once we’ve checked in, it’s a short walk to our room, which opens to the parking lot, roadside motel-style. This kind of layout generally is a deal-breaker for me, but since the rooms here are clustered into a tight semicircle surrounding the property, it all feels very safe, if a bit noisy at times. This is a very popular spot for wedding receptions, so if you’re looking for less “party” and more “peaceful retreat,” this probably isn’t the place for you. For a truly decadent experience, don’t miss The Spa at Graduate Athens, which includes several varieties of massage (for one or two guests), as well as manicure/pedicures, facials, waxing, body wraps and lash and brow tinting. I had a signature massage while I was there and left an hour later feeling like buttah. After unpacking, it’s time for lunch at the one restaurant I never miss when I’m in town: The Grit (199 Prince Ave.). This funky Athens mainstay still offers the same menu I ordered off of in the mid-’90s — why mess with a good thing? And while diehard carnivores may be put off by the restaurant’s all-vegetarian offerings, trust me when I tell you: You won’t miss the meat. Entrées are sizable and very filling, whether you’re ordering a Mondo Burrito for dinner or a Cowboy Omelet for brunch. The Grit’s homemade biscuits are also very tasty and although I’m not a tofu fan, the crispy-tender tofu cubes here are in a league all their own. Try the famous Golden Bowl — golden brown tofu cubes sautéed with soy sauce and nutritional yeast, topped with melted white cheese and served over brown rice. You’ll become a Grit fan forever. Grab a delicious meal at The Grit. At The Grit, you can dine outside thanks to the sidewalk seating, or grab a table or barstool inside. Once our bellies are suitably filled, we make the short drive into downtown Athens, a bustling amalgam of boutiques, restaurants, music venues and coffee shops. Mirroring the university community, there’s something here for every style and taste, whether you’re a former sorority girl with a weakness for monogrammed everything or a free-spirited bohemian reeking of patchouli. 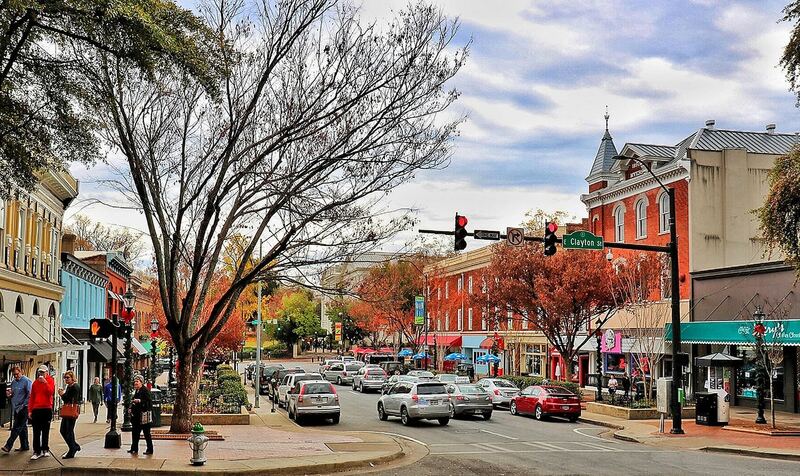 Downtown Athens has something for everyone. We always find time for Onward Reserve (146 E. Clayton), the flagship shop for this “authentically Southern” menswear brand that must be what heaven would look like if it were populated solely by Charleston’s male population. Looking for a wallet with a needlepoint GOP logo on its cover? Or a mint julep-hued madras cummerbund set? Or seersucker Croakies? It’s here. Lord help us. It’s all here. Go for the giggles or because you want to buy everything in the place. I won’t judge you either way. When in Athens, make a stop at Onward Reserve. We also make the holy music pilgrimage to Wuxtry Records (197 E. Clayton). Generations of students have bought and sold their albums, CDs and cassette tapes here and thanks to the legions of local students and struggling musicians with a constant need for beer money, the music selection at Wuxtry is outrageously good. It’s no surprise Rolling Stone named Wuxtry one of the top 25 record shops in the country. Several women’s boutiques downtown are designed to satisfy college coeds’ expensive tastes on a meager budget, and that’s a win for you and me, my friend. At Fringe (153 E. Clayton) and its sister store, Red Dress Boutique (147 College Ave.), nearly everything is under $50 — although you wouldn’t guess it unless you checked the price tags. Think of it as reverse sticker shock! And at nearby fab’rik (142 E. Clayton), everything is under $100. I happened across this store first in Savannah and fell in love with everything in it. Any time I see one now, I have to stop inside. Fringe allows fashionable dressing at a fraction of the cost. fab’rik, though slightly more expensive than Fringe, also offers affordable style. Need a caffeine boost? You’re in luck; Athens seems to attract coffeehouses like a suburban refrigerator attracts children’s drawings. My downtown pick is Jittery Joe’s (297 E. Broad St.). It opened in Athens back in 1994 when I was 18, and it was soon populated by “freaks!” — at least, that was my mom’s take. She drove to Joe’s all the way from Atlanta looking for me after I failed to return several phone calls and encountered “tattoos everywhere I looked and a man — a MAN — sitting at the counter, wearing red lipstick and a Laura Ashley dress!” If I had liked Jittery Joe’s before, I absolutely loved it after hearing my mom’s review, and I went there every chance I got throughout my college years. Clearly, I was on to something — Joe’s now boasts nine locations in Athens and several more elsewhere, including one in Japan. Go there and you, too, might encounter a man in a Laura Ashley dress. If you’re lucky. Oh yeah. The coffee’s great, too. Grab a cup of coffee and enjoy the people watching at Jittery Joe’s. Coffee in hand, we cross the street and head to the University of Georgia’s North Campus. This is the oldest section of the university, with buildings dating back to 1801. I have to get a photo beneath The Arch. Erected in the 1850s, it was designed to resemble Georgia’s state seal. Legend has it that undergraduates who walk beneath the arch either won’t graduate on time or won’t graduate at all. Consequently, the steps on either side of The Arch are worn down from years of superstitious students who refuse to walk beneath it. The North Campus is certainly the symbolic heart of the University, and an idyllic place for a photo op. When visiting UGA, keep an eye out for “The Arch.” Legend has it that undergraduates who walk beneath the arch either won’t graduate on time or won’t graduate at all. Consequently, the steps on either side of The Arch are worn down from years of superstitious students who refuse to walk beneath it. Elsewhere on campus, The Georgia Museum of Art (90 Carlton St.) is Georgia’s official art museum, and admission here is free. The museum just underwent an extensive expansion and renovation project, so there’s never been a better time than now to go. The Georgia Museum of Art is Georgia’s official art museum, and admission here is free. The famed Sanford Stadium (100 Sanford Drive) offers another great opportunity for pictures. If you’re in the mood for a little exercise, it’s a 10-minute walk from North Campus and there’s lots to see along the way, particularly if school is in session. Use the walking feature on Google Maps, and it’ll take you to Sanford Drive, which runs alongside the stadium and offers a great view into the stadium itself. With downtown shopping and obligatory I-went-to-UGA-and-now-I’m-back-tee-hee photos out of the way, it’s time for dinner. We’ve opted for the Heirloom Cafe and Fresh Market (815 N. Chase St.), a highly regarded farm-to-table restaurant located inside a former Amoco station in the Boulevard neighborhood of Athens. The menu frequently changes so that as many ingredients as possible can be sourced from local producers, farmers and artisans. And while it’s trendy now for restaurants to claim these ideals, at Heirloom it’s taken quite seriously. While we’re dining, we find out the cattle farmer who provides the beef for the restaurant’s burgers is celebrating his birthday at Heirloom with his entire family. When we meet him, we learn he recently invited the restaurant staff out to his farm so that he could show them how his cattle are raised and fed. At the end of his meal, he hugs several Heirloom employees before leaving. It gives me a warm feeling inside. I’m sappy that way. On the night we’re there, we take recommendations from Sarah, a manager and friend from my college days. She recommends the rice cakes for an appetizer, promising they’re not the Styrofoam discs that I normally avoid at the supermarket. These rice cakes are made with a melt-in-your-mouth rice gnocchi and topped with crispy pork belly, and they are out of this world! The grass-fed burger, topped with Tillamook cheddar, is also fantastic, as are the fries. Ask for a side of kimchi ranch to dip them in, and take the whole experience to a new level. The Heirloom Cafe also has an inventive selection of artisan cocktails and local beers, and on this Saturday night, the bar is packed with locals — one of whom is wearing a firefighter’s coat and boots. Thinking he might have just returned from fighting the recent wildfires, I ask Sarah if he’s a firefighter. Heirloom is a delicious farm-to-table restaurant in the Boulevard neighborhood of Athens. Make sure to try an artisan cocktail when at Heirloom. Dinner may be over, but on a Saturday night in Athens, the fun is just beginning. We pick up a Flagpole — the town’s alt-weekly — to assess our options, but it’s hard to narrow them down. The most intriguing include a “Silent Disco” at the Highwire Lounge (269 N. Hull St.), where dancers pay $1 for headphones and dance the night away to music that only they can hear. At Hendershot’s Coffee Bar (237 Prince Ave.), North Carolina songwriter Jonathan Byrd is billed to combine the “Texas songwriting tradition” with “Southern storytelling and hot guitar-picking.” Sounds good to me. At Flicker Theatre & Bar (263 W. Washington St.), we can see four different bands for just $5, with acts ranging from “folksy psych” to “Cali-country.” But I’m most interested in hearing the Bit Brigade at Caledonia Lounge (256 W. Clayton St.) — a local supergroup that plays the entire soundtrack to a video game while gamer Noah McCarthy plays — and beats — the game onstage. Look up Bit Brigade on YouTube. It is every bit as geektastic as it sounds. We opt for Bit Brigade … at least until we learn that they won’t be taking the stage until well past midnight. Silent Disco hasn’t started yet at the Highwire, and when we walk around the corner to Flicker, the crowd we can see through the windows looks daunting. Fortunately, two of my favorite bars are right across the street. The Manhattan Cafe (337 N. Hull St.) hasn’t changed since it opened 20 years ago, and that’s just the way the locals like it. This beloved dive is the perfect place for a hot toddy on a cold night, or the house special — Blenheim’s Ginger Ale and Maker’s Mark. Free popcorn is the icing on the cake. Right around the corner, the Little Kings Shuffle Club (223 W. Hancock Ave.) is housed in a lovely old building and boasts great drinks and a wonderfully diverse clientele, plus it just might be the most grown-up bar in town. The club made local headlines a couple of summers ago for banning everyone under 25 on Friday and Saturday nights. We end our evening with a round of drinks and people-watching here before heading back to our hotel for the night — after all, we have a big day planned tomorrow. Sunday morning dawns and we head (along with everyone else in Athens) to Mama’s Boy (197 Oak St.) for what’s widely considered to be the best breakfast in town. Taste one of their super-sized square biscuits and you’ll understand why people are willing to wait an hour or longer for a table at this a.m. hotspot. We opt for Georgia Peach French Toast and the Mill Town Breakfast Plate. Everything is prepared to perfection and we leave feeling marvelously gluttonous. When breakfast is on the agenda, head to Mama’s Boy. Enjoy a hearty breakfast at Mama’s Boy. Outside it’s raining, but the Indie South Fair is in town for the weekend, so we decide to brave the elements and check it out. Billed as a “traveling curated market that brings together artists, designers, and creative entrepreneurs,” it makes a stop in Athens several times a year (it will be back February 12th), and it’s well worth a visit. We have a great time meeting this diverse crowd of makers and artists from across the South, like Chad McIlvenna and Robert Bell, the brothers-in-law behind Bell Robertson. They make beautiful leather totes, wallets and belts, and they also restore vintage axes — I’ll bet you’ve been wanting to give that old, rusty axe in your bedroom closet a new life, right? Well, these guys can help. But my favorite find has to be artisan lampmaker George Stankus, who uses found and recycled goods to create amazing one-of-a-kind lamps. The Columbia, South Carolina native lost everything in the recent floods there and is now rebuilding his life, one lamp at a time. An exhibitor at the Indie South Fair. I fell in love with this iconic, yet totally affordable jewelry from Daedal. Thank God metalworker Caitlin Galvin has an Etsy store! We head next to the Five Points neighborhood, a charming shopping and restaurant district where we feel compelled to conduct a thorough investigation of Condor Chocolates (1658 S. Lumpkin St.). Opened by brothers Nick and Peter Dale, the shop functions as both a chocolate factory and cafe, and serves up many varieties of exquisite chocolate, all made from Ecuadorian caçao. I’ll be honest — if I see a local chocolate shop, I have to stop and sample its wares for myself. From their rich seasonal house-made truffles to their Cloud Boulder (a giant house-made marshmallow coated in dark chocolate), Condor Chocolates may make the best chocolate I’ve ever tasted. In fact, when I win the lottery someday, I plan to buy Nick and Peter Dale and their chocolate factory so that I can force them to work around the clock in shifts and eat everything they produce myself. Condor Chocolates is both a chocolate factory and cafe. This may be my most favorite chocolate ever! Get a look at the magic happening right there in front of your eyes. Until that day comes, Condor patrons can sit at a bar that rims the candy kitchen, drink a delicious sipping chocolate or mocha milkshake, and watch the birth of this miraculous candy. There’s only one thing I like as much as chocolate: books. And today is my lucky day — Avid Book Shop (1662 S. Lumpkin St.) has just opened a second location right next door to Condor! Inside, the selection is small, but lovingly curated — I feel like a friend has chosen everything on the shelves and tables just for me. If you love to read, a stop here is definitely in order. Before leaving, we duck inside Two Story Coffee (1680 S. Lumpkin St.), which is packed upstairs and down with more students studying for exams. I can understand why this place is a local favorite. It was originally a house, and its many rooms give the place an intimate feel. We head back to our hotel to rest for a bit and get ready for dinner. Eager to see as much of what Athens has to offer as possible, we decide on pre-dinner drinks at The Rook & Pawn (294 W. Washington St.). It’s a good call; this has to be one of the coolest pubs on earth. A wall of shelves here holds 700 board games, all yours for the playing. Pay $5 per person (kids under 13 play free with a paying adult), and you can play any game you want, all day long. The concept has really taken off — when we stop in on a Sunday at 4:30 p.m., the place is packed with students, adults and families. There’s the feel of a cozy hobbit-hole, something that’s clearly not lost on its owners; specialty drinks include the “Frodosynthesis,” “Drop It Like It’s Hoth” and “It’s Not Butterbeer.” We opt for the locally brewed Terrapin Beer and become instant fans. We only have time for one drink before heading to an early dinner at Last Resort Grill (174 W. Clayton St.), another place I try not to miss any time I’m in Athens. Apparently, we’re not the only ones who think this place is the bomb — the Georgia Legislature has reserved the restaurant from 6:30 p.m. on, hence our early reservations. The place originally opened as a music club in 1962 and hosted such notable names as Townes Van Zandt, Jimmy Buffett and Steve Martin. It was turned into a restaurant in 1992, and its cozy ambiance and stellar menu make it a guaranteed great night out. My husband and I have traveled quite a bit since the last time we were in Athens and had some world-class meals. I have great memories of Last Resort’s dishes, but I wonder privately if they’ll live up to my standards today. Fortunately, the kitchen does not disappoint — I order the restaurant’s signature dish, the Praline Chicken, and it is absolutely divine. It consists of a double chicken breast stuffed with a medley of cheeses, topped with walnut-honey drizzle and served with fresh, buttery green beans and a heavenly stack of crisp potato pancakes held together with melted goat cheese. I’m in culinary heaven. After dinner, we head to Normaltown, a charming Athens neighborhood with three fantastic bars where drinks are cheap and students are at a minimum. Normal Bar (1365 Prince Ave.) has been around for years and is a popular watering hole with a wide variety of locals. We love its warm, welcoming feel, not to mention its generous pours and locally brewed beers. The heated back deck is a popular gathering spot, which keeps the main room from getting too crowded. Don’t miss the boiled peanuts — a bowlful is just $1. The Old Pal (1320 Prince Ave.) is another favorite. Here, you’ll find classic cocktails, craft beers, an eclectic crowd and often, a DJ spinning old-school beats that give the bar a festive feel. Southern Living named this place one of the “South’s Best Bars” last year, and I have to concur. It is Sunday night, though, and most Athens bars are closed. Fortunately, Normaltown’s Hi-Lo Lounge (1354 Prince Ave.) isn’t one of them. We end our journey where I began this story, listening to a Colombian rhapsodize about his chihuahua and Gabriel Garcia-Marquez. Eventually, the rain tapers off and my husband and I decide it’s time to head back to our hotel. As we put on our coats, we pause to watch a group of people from the other room drag a woman out the front door who appears to have passed out, although strangely, a sneaky grin is visible beneath her closed eyes. As soon as they manage to get her outside, she “miraculously” awakens and begins shouting at her friends, who have called her a cab. A man in a long red cape heads out and attempts to referee the disagreement. It’s just another night in Athens. And that’s exactly how I like it. Special thanks to VisitAthens.com for hosting our stay. Check out all of our travel articles. Click here and find the perfect Southern destination for you!